What is the TCP Server/Client Mode? The TCP Server/Client mode allows ezTCP to function as a TCP server or Client. If users had wanted to change the mode to another, it would have been needed to set manually by ezManager. In this mode, however, it doesn't need that to change the each mode. The basic concept of this function is like below. The basic operation is started as a TCP client. 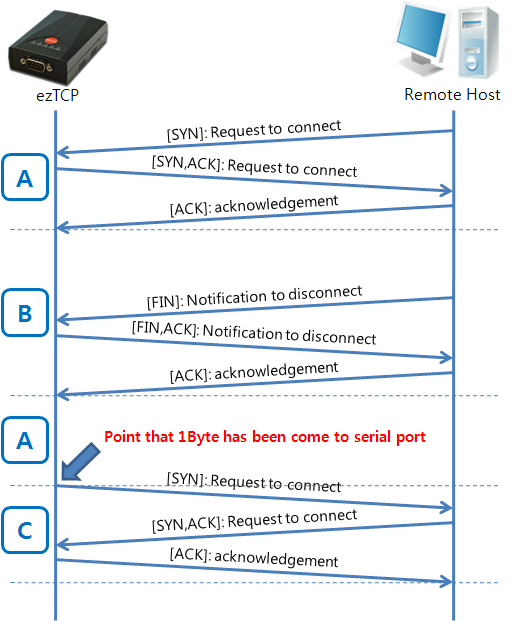 If ezTCP don't get any connection, it listen a request segment to its local port as a TCP server. This doesn't mean multiple connections. Only one host can be connected to another. The check box named [TCP Server] is activated as long as the value of [ezTCP mode] is selected to TCP Client. If you check this option, the mode is activated. Till now (FEB. 2014), below products have been equipped this mode. This options may quit useful if the [Event Byte] and [Timeout] items are properly set. The document for this mode will be offered soon. If you have any questions about this mode, please contact our technical support team anytime you want.